Congratulations to The Center for Games and Playable Media's Brenda Romero, and DANM 1st Year Student Deirdra Kiai who will be showing their games at this year's IndieCade, the International Festival of Independent Games. IndieCade takes place October 5-6 in Los Angeles, CA. Check out the IndieCade website for more information. 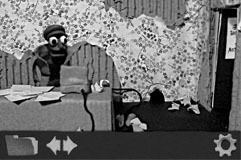 Dominique Pamplemousse is an interactive musical comedy in stop motion, in which the titular protagonist is a down-on-their-luck private investigator of ambiguous gender only one rent payment away from homelessness. When the CEO of a major record company shows up asking Dominique to locate a missing pop star, taking the job appears to be the straightforward thing to do. However, as things are never quite as they seem in these kinds of stories, Dominique winds up framed for a crime they didn’t commit, bringing to surface their mysterious past and the events that led them to take up shady detective work in the first place. Brenda Romero's "PreConception (pregame notgame)"
PreConception (pregame notgame) is a game without rules. It represents the neutral state game designer’s mind as he or she considers the possibility space of a new game.